Alvaro Santiago was born in Oaxaca, Mexico in 1953 and studied painting at the Escuela de Bellas Artes of the Universidad Autonoma Benito Juarez in Oaxaca, and at the prestigious La Esmeralda School of Painting and Sculpture in Mexico City. 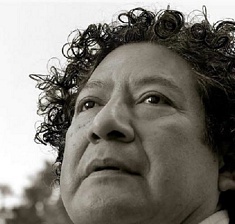 His first solo show was at the Fundacion Cultural Miguel Cabrera in Oaxaca in 1978 to great success. Many other exhibitions followed in Mexico, France, Belgium, Australia, Costa Rica, Canada, Germany, Spain, Ireland, Japan and the US. Alvaro is also an accomplished muralist with such public works in Oaxaca, Puebla, Coahuila, Chihuahua, Tamaulipas, Baja California, Michoacan and Mexico City.